TPC Overall Rank: #253 out of 2933 rides. Loses a point for windshields but is still a drop ride so it is good for that. Space shot.. yawn. views of SoCal.. double yawn. scream guards... stupid. One of the lamest space shots Ive been on. 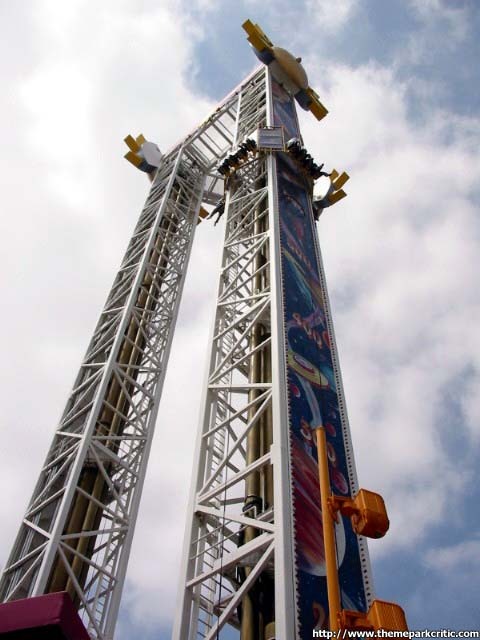 Wow, Disney tried adding yet another pretty thrilling ride, but like I said, they "tried". I for one actually think that Disney themed this pretty well and it really provokes many memories as a kid trying to showcase my skills on the Coney boardwalk. Also, this thing didnt have a wait at all! I will say it strongly, I HATE THOSE (EXPLETIVE) SCREAM SHIELDS! They certainly detracted from my exprience and just were extremely annoying. The views during the ride of the entire resort is incredible though, but this in reality is a pretty weak tower. 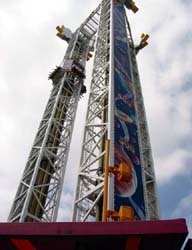 The launch has very little speed, but there actually is some air at the top. 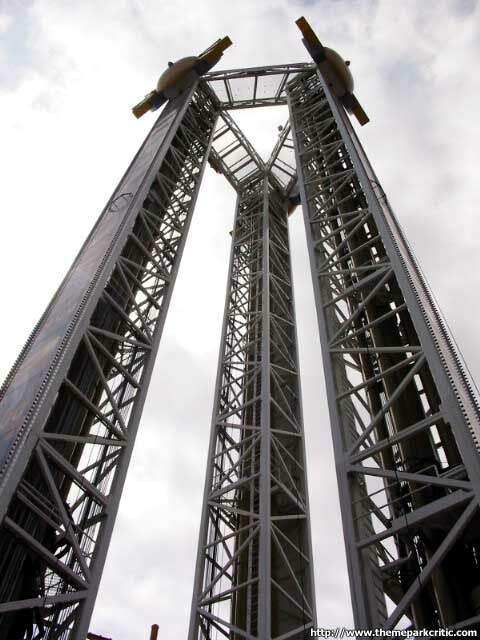 Still, a weak launch combined with those scream shields weakens this ride to a pretty mediocre tower. I like space shots, but this one was weaker than others. The launch was fairly sudden and the sound effects were a nice touch, but the launch was relatively weak. There was some good air at the top though. It loses a point though for those annoying scream shields. 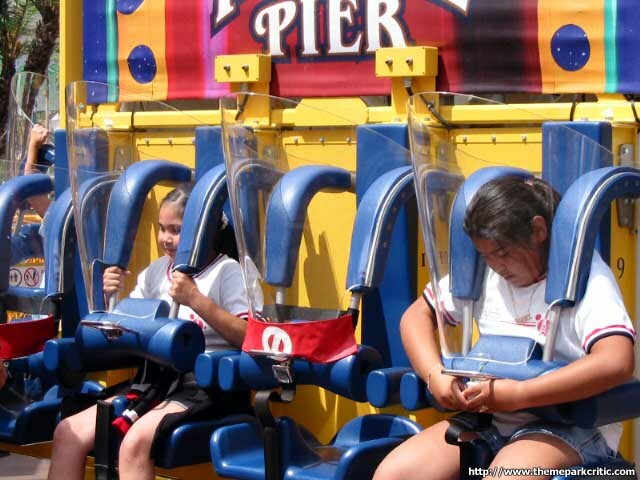 OK, to the best of my knowledge, the plexiglass shields in front of your face on this ride are to lower the noise to nearby areas... although most amusingly, the look like sneeze guards on a salad bar. 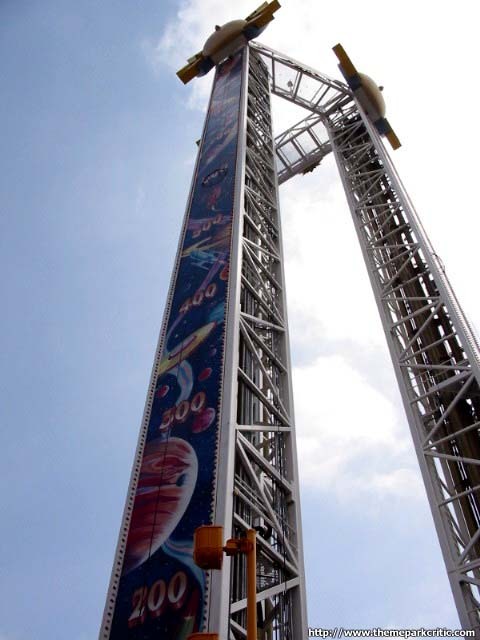 Anyway, the ride is your totally typical space shot: cool on the rise up, so-so on the drops, nice view, overall solid if not great. Its themed like one of those ring the bell midway games; there was a soundtrack playting a hammer whacking stuff before the launch, but I didnt hear any bell ring when we reached the top. This ride is smack in the middle of the California Screamin tracks, so wave to the folks on the roller coaster when they go by. its pretty cool. Btw i thought the shells were for if someone puked. A typical S&S Turbo Shot, with nice air at the top, however as many have said the shields are useless AND ANNOYING. It loses a point for those damn shields. Its just your generic shot and fall ride. Nothing special about it. The puke shields are pointless. I mean, whos gonna vomit on this tame little thing. 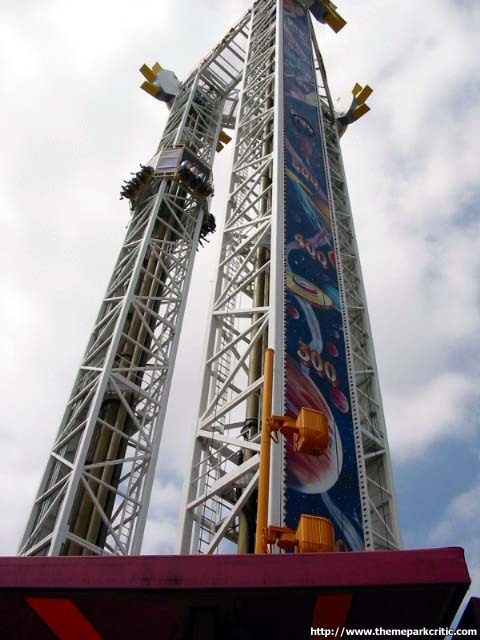 If you want a real thrill, try the Big Shot on the Stratosphere Tower in Las Vegas. heart pumping thrills on a grand scale, even if it lacks theme.